Alfred Davis and his brother-in-law Hans Wilsdorf founded Wilsdorf and Davis, the company that would eventually become Rolex SA, in London, England in 1905. Wilsdorf and Davis' main commercial activity at the time involved importing Hermann Aegler's Swiss movements to England and placing them in high-quality watch cases made by Dennison and others. These early wristwatches were sold to jewellers, who then put their own names on the dial. The earliest watches from Wilsdorf and Davis were usually hallmarked "W&D" inside the caseback. 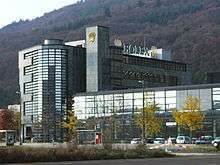 In 1908 Wilsdorf registered the trademark "Rolex" and opened an office in La Chaux-de-Fonds, Switzerland. The company name "Rolex" was registered on 15 November 1915. The book The Best of Time: Rolex Wristwatches: An Unauthorized History by Jeffrey P. Hess and James Dowling says that the name was just made up. One story, never confirmed by Wilsdorf, recounts that the name came from the French phrase horlogerie exquise, meaning "exquisite clockwork" or as a contraction of "horological excellence". Wilsdorf was said to want his watch brand's name to be easily pronounceable in any language. He also thought that the name "Rolex" was onomatopoeic, sounding like a watch being wound. It is easily pronounceable in many languages and, as all its upper-case letters have the same size, can be written symmetrically. It was also short enough to fit on the face of a watch. In 1919 Wilsdorf left England due to wartime taxes levied on luxury imports as well as to export duties on the silver and gold used for the watch cases driving costs too high and moved the company to Geneva, Switzerland, where it was established as the Rolex Watch Company. Its name was later changed to Montres Rolex, SA and finally Rolex, SA. Upon the death of his wife in 1944, Wilsdorf established the Hans Wilsdorf Foundation, a private trust, in which he left all of his Rolex shares, making sure that some of the company's income would go to charity. Wilsdorf died in 1960; since then, the trust has owned and run the company. In December 2008, following the abrupt departure of Chief Executive Patrick Heiniger for "personal reasons", the company denied that it had lost 1 billion Swiss francs (approx £574 million, $900 million) invested with Bernard Madoff, the American asset manager who pleaded guilty to an approximately £30 billion worldwide Ponzi scheme fraud. Rolex SA announced Heiniger's death on 5 March 2013. As of 2010 Rolex watches continue to have a reputation as status symbols. Rolex was also the first watch company to create a water resistant wristwatch that could withstand pressure to a depth of 100 m (330 ft). Wilsdorf even had a specially made Rolex watch (the watch was called the "DeepSea") attached to the side of Trieste, which went to the bottom of the Mariana Trench. The watch survived and tested as having kept perfect time during its descent and ascent. This was confirmed by a telegram sent to Rolex the following day saying "Am happy to confirm that even at 11,000 metres your watch is as precise as on the surface. Best regards, Jacques Piccard". Rolex produced specific models suitable for the extremes of deep-sea diving, caving, mountain climbing, polar exploration, and aviation. Early sports models included the Rolex Submariner (1953) and the Rolex Oyster Perpetual Date Sea Dweller. The latter watch has a helium release valve, co-invented with Swiss watchmaker Doxa, to release helium gas build-up during decompression. The Explorer (1953) and Explorer II (1971) were developed specifically for explorers who would navigate rough terrain, such as the world famous Mount Everest expeditions. Another iconic model is the Rolex GMT Master (1954), originally developed at the request of Pan Am Airways to provide its crews with a dual time watch that could be used to display GMT (Greenwich Mean Time), which was the international time standard for aviation at that time and was needed for Astronavigation during longer flights. Montres Tudor SA has designed, manufactured and marketed Tudor watches since 6 March 1946. Rolex founder Hans Wildorf conceived of the Tudor Watch Company to create a product for authorized Rolex dealers to sell that offered the reliability and dependability of a Rolex, but at a lower price. Historically, Tudor watches have been manufactured by Montres Tudor SA using movements supplied by ETA SA. Since 2015 however, Tudor has begun to manufacture watches with in-house movements. The first model introduced with a in-house movement was the Tudor North Flag. Following this, updated versions of the Tudor Pelagos and Tudor Heritage Black Bay have also been fitted with an in-house caliber. 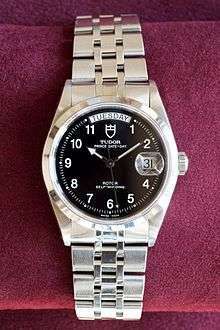 Tudor watches are marketed and sold in most countries around the world including the United States, Australia, Canada, India, Mexico, South Africa, many countries in Europe, South Asia, the Middle East and countries in South America, particularly Brazil, Argentina and Venezuela. Montres Tudor SA discontinued sales of Tudor-branded watches in the United States in 2004, but Tudor returned to the United States market in the summer of 2013 and to the UK in 2014. Rolex has three watch lines: Oyster Perpetual, Professional and Cellini (the Cellini line is Rolex's line of "dress" watches). The primary bracelets for the Oyster line are named Jubilee, Oyster. and President. The name of the watch lines in catalogs is often "Rolex Oyster Perpetual ______" or "Rolex ______"; Rolex Oyster and Oyster Perpetual are generic names and not specific product lines, except for the 36 mm Oyster Perpetual model. The Air-King is the least expensive Oyster Perpetual watch. The Date is related to the Air-King but adds a date display. Certain models from the Date and Datejust are almost identical, however the Datejust has a 36 mm case and a 20 mm bracelet compared to the Date's 34 mm case and 19 mm bracelet. Modern versions of the Oyster Perpetual Date and Datejust models share Rolex's 3135 movement, with the most recent change to the 3135 movement being the introduction of Rolex's "parachrom bleu" hairspring, which provides increased accuracy. As the Date and Datejust share a movement, both have the ability to adjust the date forward one day at a time without adjusting the time; this feature is not confined to the Datejust. The Datejust is available in a wider range of metals and has a greater range of dials available. In the UK, the retail price for the stainless steel 'Pilots' range (such as the GMT Master II) starts from GBP5,600. Diamond inlay watches are more expensive. The book "Vintage Wristwatches" by Antiques Roadshow's Reyne Haines listed a price estimate of Rolex watches that ranged between US$650 and US$75,000, while listing Tudors between US$250 and US$9,000. The most expensive Rolex ever produced by the Rolex factory was the GMT Ice reference 116769TBR with a retail price of US$485,350. A Forbes magazine article on the Swiss watch industry compared the retail value of Rolexes to that of competing brands Corum, Universal Genève and IWC. In tennis, Rolex is the official time keeper of Wimbledon and the Australian Open, two of the four Grand Slams. In golf, it is the official time keeper for two of the four majors, The Open Championship and the U.S. Open, as well as the PGA Tour and European Tour; the presenting sponsor for one of the five senior majors, The Senior Open Championship; and the official sponsor of the Women's World Golf Rankings. Rolex is the title sponsor to the 24 Hours of Daytona, from which the Daytona model takes its name, along with the Rolex Sports Car Series. In 2013, Rolex became the official timekeeper to the FIA Formula 1 motor racing championship. Rolex has also been the official timekeeper to the Le Mans 24 Hours motor race since 2001. By the start of World War II Royal Air Force pilots were buying Rolex watches to replace their inferior standard-issue watches. However, when captured and sent to POW camps, their watches were confiscated. When Hans Wilsdorf heard of this, he offered to replace all watches that had been confiscated and not require payment until the end of the war, if the officers would write to Rolex and explain the circumstances of their loss and where they were being held. Wilsdorf was in personal charge of the scheme. As a result of this, an estimated 3,000 Rolex watches were ordered by British officers in the Oflag (prison camp for officers) VII B POW camp in Bavaria alone. This had the effect of raising the morale among the allied POWs because it indicated that Wilsdorf did not believe that the Axis powers would win the war. American servicemen heard about this when stationed in Europe during WWII and this helped open up the American market to Rolex after the war. On 10 March 1943, while still a prisoner of war, Corporal Clive James Nutting, one of the organizers of the Great Escape, ordered a stainless steel Rolex Oyster 3525 Chronograph (valued at a current equivalent of £1,200) by mail directly from Hans Wilsdorf in Geneva, intending to pay for it with money he saved working as a shoemaker at the camp. The watch (Rolex watch no. 185983) was delivered to Stalag Luft III on 10 July that year along with a note from Wilsdorf apologising for any delay in processing the order and explaining that an English gentleman such as Corporal Nutting "should not even think" about paying for the watch before the end of the war. Wilsdorf is reported to have been impressed with Nutting because, although not an officer, he had ordered the expensive Rolex 3525 Oyster chronograph while most other prisoners ordered the much cheaper Rolex Speed King model which was popular because of its small size. The watch is believed to have been ordered specifically to be used in the Great Escape when, as a chronograph, it could have been used to time patrols of prison guards or time the 76 ill-fated escapees through tunnel 'Harry' on 24 March 1944. Eventually, after the war, Nutting was sent an invoice of only £15 for the watch, because of currency export controls in England at the time. The watch and associated correspondence between Wilsdorf and Nutting were sold at auction for £66,000 in May 2007, while at an earlier auction on September 2006 the same watch fetched A$54,000. Nutting served as a consultant for both the 1950 film The Wooden Horse and the 1963 film The Great Escape. Both films were based on actual escapes which took place at Stalag Luft III. It was also reported that in November 2013 the Rolex Speed King owned by Flight Lieutenant Gerald Imeson during the Great Escape was sold for £60,000. Rolex watches are frequently counterfeited, often illegally sold on the street and online. 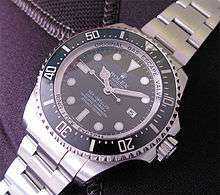 Counterfeit Rolex watches vary in quality, with some using the cheapest of movements and others using automatic movements, some even with an ETA movement. However, most counterfeit watches are easily identifiable by jewellers and other experts. O. J. Simpson wore a counterfeit watch during his murder trial. Rolex SA is owned by the private Hans Wilsdorf Foundation, which is registered as a charity and does not pay corporate income taxes. In 2011, a spokesman for Rolex declined to provide evidence regarding the amount of charitable donations made by the Wilsdorf Foundation. 1 2 "The World's Most Valuable Brands". Forbes. May 2016. Retrieved 11 May 2015. 1 2 "Rolex top of the chronometer tree in 2011". Europastar.com. Retrieved 19 June 2013. 1 2 3 "Rolex story". Fondation de la Haute Horlogerie. Retrieved 22 July 2008. ↑ Hess, Jeffrey P.; James Dowling (2008). The Best of Time: Rolex Wristwatches: An Unauthorized History. Schiffer Publishing Ltd. ISBN 978-0-7643-1367-7. 1 2 3 4 5 6 7 Stone, Gene (2006). The Watch. Harry A. Abrams. ISBN 0-8109-3093-5. OCLC 224765439. 1 2 3 4 5 6 Liebeskind, David (Fall–Winter 2004). "What Makes Rolex Tick?". Stern Business. New York University Stern School of Business. Retrieved 14 January 2010. ↑ Marcus Leroux. "Madoff casts shadow over Rolex as chief executive Patrick Heiniger quits". The Times. 20 December 2008. ↑ Branch, Shelly (1 May 1997). "CNN Money". CNN. Retrieved 14 January 2010. ↑ "Time Magazine: China". TIME. 21 September 2007. Retrieved 14 January 2010. ↑ Vogel, Carol (6 December 1987). "Modern Conveniences". New York Times. Retrieved 14 January 2010. ↑ Cartner-Morley, Jess (1 December 2005). "What is it with men and their watches?". The Guardian. UK. Retrieved 14 January 2010. ↑ "Rolex Submariner 6204". Jake's Rolex Blog. ↑ Paul Altieri. "Rolex Day Date (President) 1803". Bob's Watches. Retrieved 21 November 2014. ↑ "The Quartz Date 5100". oysterquartz.net. Retrieved 27 February 2007. ↑ "The 5035 movement". oysterquartz.net. Retrieved 19 February 2008. ↑ "How to Buy a Watch". gq.com. 13 October 2009. Retrieved 14 January 2010. ↑ "Rolex production news from ',Swiss Watch News 2005',". Fhs.ch. 15 July 2005. Retrieved 14 January 2010. ↑ "Buying A Tudor". Montres Tudor SA. ↑ Clymer, Benjamin. "It's Official: Tudor Is Coming Back To The United States, And Soon! — HODINKEE – Wristwatch News, Reviews, & Original Stories". Hodinkee.com. Retrieved 19 June 2013. ↑ Haines, Reyney (12 April 2010). 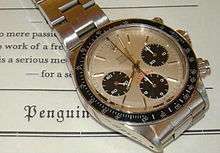 Vintage Wristwatches (Rolex price listing pages 188–204; Tudor price listing pages 221–222). Krause Publications. ISBN 1-4402-0409-8. ↑ Forbes, Bertie Charles (1980). "Forbes Magazine". 126. Forbes, Inc.: 286. ↑ "24 Hours of Le Mans | ACO - Automobile Club de l'Ouest". 24h-lemans.com. Retrieved 2016-06-14. ↑ "Official Rolex Website - Timeless Luxury Watches". Rolex.com. Retrieved 2016-06-14. ↑ "Video: Racing Legend Sir Jackie Stewart Talks Rolex At Pebble Beach 2014". Quill & Pad. 27 August 20014. ↑ Brozek, John E. (April 2004). "Everest: A Pinnacle of Achievement for Rolex" (PDF). International Watch: 42. Retrieved 3 August 2008. Quote: "It's worth mentioning that some members of the 1953 expedition were pictured wearing two watches—one on each wrist. With that being said, it is possible that Hillary also wore a Rolex on the expedition, but simply wore the Smiths during the summit leg of the climb. Others believe he may have worn both to the summit or that he possibly wore a Rolex while he simply 'carried' the Smiths in his pocket. Whatever the case, it has remained a mystery to this day, and it is not likely that we will ever know for certain". ↑ Brozek, John E. (December 2003). "The Vindication: Mercedes Gleitze and Rolex take the plunge and become world-renowned" (PDF). International Wristwatch Magazine: 88. Retrieved 3 August 2008. 1 2 "Picture of the watch and Rolex certificate with Nutting's name". Retrieved 14 January 2010. ↑ Madoff ‘Prisoner’ Rolex Sale Won’t Calm Swiss Time Town’s Ire Quote: "The prisoners involved in the mass breakout from Stalag Luft III in March 1944, depicted in the Steve McQueen film "The Great Escape", may have used the watches to time the movements of guards as they dug tunnels out of the camp, Antiquorum said." 1 2 3 "Walker Money Hunt from Maclean's Magazine". thecanadianencyclopedia.com. Retrieved 14 January 2010. ↑ "Simpson's Rolex is a fake, Goldmans find - latimes". Articles.latimes.com. 2007-10-06. Retrieved 2016-06-14. ↑ "Jeweler Finds O.J. Simpson's Rolex Watch to Be Fake". Fox News. 2007-10-05. Retrieved 2016-06-14. ↑ Dillonnews, Nancy (2007-10-03). "Lawyer: O.J. 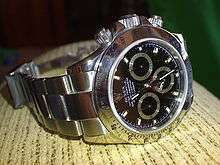 's Rolex given to Goldman family a fake". NY Daily News. Retrieved 2016-06-14. ↑ 1 (2007-09-18). "Judge to Goldmans: O.J. 's Rolex Is Yours!". TMZ.com. Retrieved 2016-06-14. ↑ Andrew Blankstein The Los Angeles Times. "OJ Turns Over Fake Rolex To Goldman Family". Huffingtonpost.com. Retrieved 2016-06-14. ↑ Helmer, John (16 March 2011). "Privatizing Rolex – The Fake Tells A Truer Tale". Business Insider. Retrieved 26 February 2013. Wikimedia Commons has media related to Rolex.